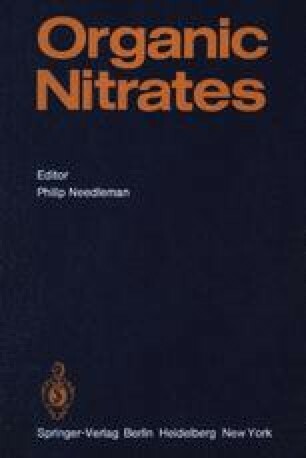 The investigation of organic nitrate biotransformation began with the observation by Hay (1883) and by Crandall (1929, 1933) that inorganic nitrite appears after incubation of glyceryl trinitrate (GTN) with blood. CrandallCrandall et al. (1929) demonstrated that GTN rapidly disappeared from the circulation after intravenous administration to dogs and inorganic nitrite could be qualitatively detected. Yagoda and von Oettingen (1944) incubated GTN, erythrityl tetranitrate (ETN), and pentaerythrityl tetranitrate (PETN) with dog blood and demonstrated the formation of inorganic nitrite.